Staying safe during travel season! – Independence Through Connections. Staying safe during travel season! Reports show that an increasing number of seniors are traveling abroad, which is wonderful! In order to promote safety and preparedness, The State Department has launched a global information campaign. Medicare does not cover health care overseas, the State Department “highly recommends” obtaining health insurance that covers emergency medical and dental treatment abroad, as well as medical evacuation to the U.S. Learn more about this, and how to find plans, by clicking here. Passports need to be valid six months beyond the end of the trip; otherwise, some countries may not let you enter. To avoid questions or delays at customs or immigration, keep medications in their original, labeled containers. Bring an ample supply of medication to cover you for your trip and, if possible, for a few extra days in case there are delays. Stay connected through the Smart Traveler Enrollment Program (STEP), where information is stored securely and enables the U.S. Department of State, U.S. embassy, or U.S. consulate to contact the traveler or their family. Click here to access the STEP website. Beware of scams! Scammers intend to get money from their victims by making the victims believe they will gain something of great personal value (financial gain, romantic relationships, helping someone in trouble, etc.). Scammers operate primarily via the internet, email, and phone. 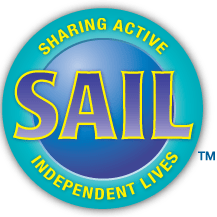 SAIL members who are getting ready to travel and need some help making sure they’re ready to go can feel free to call the SAIL office for help! 608-230-4321. Get this information and more in a printable handout here. Get a printable travel checklist here. Got more travel tips to share or a personal story? E-mail meghan@sailtoday.org or call us at 608-230-4321. Next ›File Of Life Is For Real!